At times, it’s easy to be cynical about this country, this world, and everything in it. But other times, there is room for optimism. And so it is with the Casey Kasem story. Like many a kid in the ‘70s, during that phase just before teen angst hits, Casey Kasem played an oversized part in my life, often without me even knowing it was him. Sure I listened to America’s Top 40 every Saturday (or was it Sunday?) morning. That’s what people did before cable. I knew Kasem’s voice well from that alone. Only much later did I learn that he was also the voice of Shaggy on Scooby Doo. Do you remember where you were when you first learned that Casey Kasem was the voice of Shaggy? I don’t either, but I do remember that it blew my mind even more than finding out that Doc from Love Boat was the same guy who played Siegfried on Get Smart. From the smooth radio baritone of the Voice of America to Shaggy–that’s range. Scooby Doo is the Brady Bunch of Saturday morning cartoons, in the sense that you never really outgrew it. Even though it’s so patently dumb, the characters continued to resonate somehow. 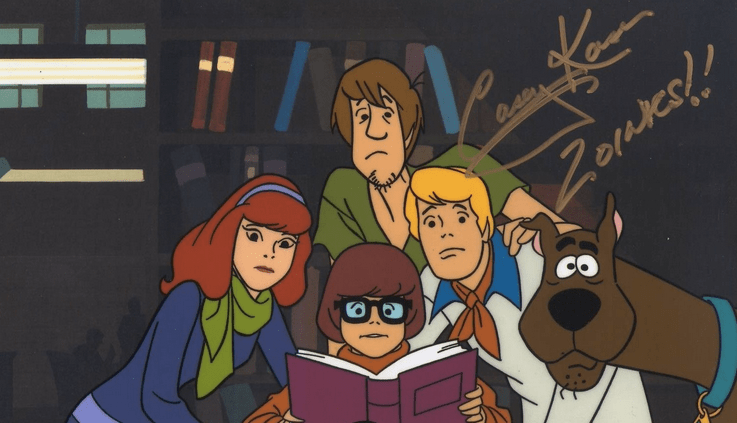 I’ve heard that the creator of Scooby Doo came up with these characters by basing them on the first four people he saw coming off the campus of UCLA one afternoon. That makes perfect sense, because they do feel like real college students, the kind that preteens in the 70s would identify with and want to emulate more than bygone teens from a pre-enlightened era like the Archies. The characters made sense. They were recognizable types. These are what teenagers from good homes who went off to college looked like in the early ‘70s. There was Velma, the asexual library science major; there were Fred and Daphne, two straights in it for the thrills like Patty Hearst and Steven Weed; and then there was Shaggy, part all-American teenager, part ‘60s acid casualty. Shaggy’s real name is Norville Rogers. Norville was much like Richie Cunningham when he went off to college. But sometime during his freshman year, Norville unknowingly chugged a cup of keg beer that had been laced with 40-50 hits of LSD, put there either by an outside Yippie agitator or as part of a covert CIA experiment; nobody knows for sure. Either way, Norville Rogers turned into Shaggy, and he has never been the same since. He’s highly paranoid, socially retarded (his only friend is a dog), and shows clear signs of diminished mental capacity. in spite of all that, or because of it, he’s our favorite Scooby Doo character. Nobody knows exactly what Shaggy is and what his motivations are. Is he a drug fiend? An aspiring musician? A simple kid in a grownup’s body? What makes Shaggy tick? We don’t know the answer to that. In fact, we don’t know what makes any of the Scooby Doo characters tick. The others are pretty two dimensional and uninteresting as individuals. But Shaggy is someone who intrigues us. His character pops. It’s never boring or dull with Shaggy. Normally you’d credit the actor for that, but since we’re talking about animation here, all that credit has to go to the voice behind the character–none other than the Voice of America, Casey Kasem. Only much later did I learn that Casey Kasem was Lebanese. Today, there is slightly more of an Arab-American presence in society, but back then you didn’t hear about Arabs much, except in a stereotypically villainous sort of way. But America can be an inclusive culture. You don’t hear the name Casey Kasem and think, “Oh, that’s an Arabic name.” ‘Casey Kasem’ has an everyman feel to it. That’s the miracle of America. You can come here from almost anywhere, flatten out the vowels of your surname, adopt a friendly moniker as your first name, and voila, you’re the Voice of America. Casey Kasem next fulfilled another phase of the American dream by marrying a statuesque blonde with a 20-year age difference named Jean (btw, it’s not surprising to learn 30 years later that she’s basically as nutty as a fruitcake, which I say amicably, not vindictively). For people whose formative childhood years were in a simpler Internet-free time, before the end of the Cold War and after Vietnam, Casey Kasem was the voice of Saturday morning when Saturday morning was the high point of the week. ← Ann B. Davis (1926-2014). Alice Has Left the Kitchen.